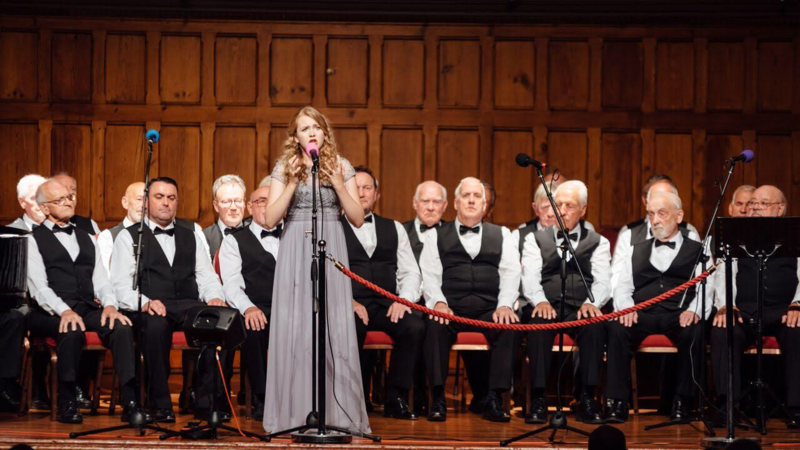 Britain’s Got Talent star Beau Dermott was the special guest of The City of Chester Male Voice Choir at their concert at Chester Town Hall. We Are Chester’s Paul Crofts went along to see this rising young star take centre stage. Photos: Paul Crofts and Will Hay at W777 Photography. There had been quite a build-up to this much awaited concert, and so it was fantastic to see the Assembly Room in the Town Hall packed to capacity. Under the musical direction of Rodney T Jones, The City of Chester Male Voice Choir opened with the appropriately titled I Am The Song written especially for them by Welsh composer Robat Arwyn, before paying their own tribute to the centenary of the end of The Great War with Here’s To The Heroes. Songs from the shows always go down well and one of my favourite pieces from the choir during the first half was This Nearly Was Mine from South Pacific, some beautifully rich harmonies here, just gorgeous. The choir were clearly on fine form, buoyed no doubt what they knew was yet to come. Guest artiste Beau Dermott took to the stage and just blew everyone away with her assured, confident performance. Opening with Someone Like You from the musical Jekyll And Hyde, Beau has a maturity to her voice which makes you forget at times that she is in fact only 14 years old. Beau showed off her versatility with her next song They Just Keep Moving The Line from Smash, a musical about Marilyn Monroe, transporting us effortlessly to the smoky, seductive atmosphere of a nightclub in downtown Chicago, great stage presence here. Beau has already recorded her debut Album, Brave, having signed a deal with Decca Records, and up next we were treated to her favourite song Sparkles, which had been translated especially for her from the original Japanese lyrics. Beau then had a surprise up her sleeve as she introduced her own special guest, Wirral-based singer Tom Spence, who took us to the West End with a sensitive performance of Bring Him Home from perennial favourite Les Miserables, sung with just the right amount of emotion. One of the highlights of the concert was Beau’s much awaited performance with The City Of Chester Male Voice Choir and they did not disappoint with a spine-tingling performance of Hallelujah, the Choir underpinning Beau’s voice in a beautiful arrangement. The choir rounded off the first half with John Rutter’s Sprig Of Thyme, an arrangement of traditional English songs – Down By The Sally Gardens and the quirky Miller Of Dee with its local references. This arrangement, especially Miller Of Dee is tougher for the pianist than for the choir and so hats off to Helen Jackson for her accomplished playing. The second half opened with the choir performing a rousing arrangement of When The Saint’s, which got feet tapping. The choir showed just how versatile they are with their next piece, a beautifully understated piece of sacred music Veni Jesu, which required much control – too much volume and you’ve blown it. There were no such problems for the choir, with this piece beautifully sung thanks in no small part to the dedication of their musical director Rodney T Jones in bringing out such a beautiful performance. Other highlights of this section included a rousing arrangement of The World In Union which was greeted with rapturous applause by the audience. Beau Dermott soon made her return to the stage with Wings, which once again showed off the power in the voice. Her duet with Tom Spence on The Prayer was just perfect, their voices blending beautifully, both of them giving Andrea Bocelli and Celine Dion a run for their money. This concert was certainly the gift that kept on giving as Tom Spence gave us a haunting performance of Music Of The Night from Phantom Of The Opera. And then came the moment many had been waiting for, Beau performed the song which made her name on Britain’s Got Talent and changed her life overnight, Defying Gravity from Wicked. Beau’s voice soared into the cavernous space of the Town Hall and the audience rose to their feet as one, giving this 14-year-old star a much deserved standing ovation. Beau returned to the stage to sing one final number, this time joining the choir in singing I Dreamed A Dream from Les Miserables, beautifully arranged by Rodney T Jones. To round off the evening, the choir sang one of my personal favourites, Benedictus by the aforementioned Robat Arwyn, followed by the extremely tricky showstopper Rhythm of Life from Sweet Charity which brought great applause from the audience. The concert over, Beau signed autographs and happily posed for photos including allowing me to have one taken with her, such a down to earth young lady despite her success, so refreshing to see, given the cult of celebrity and immediate “fame” of today’s reality TV generation which pervades everyday life. Photos: Paul Crofts/Will Hay at W777 Photography. An excellent review that rightly captured all the magnificent performances throughout the evening. Beau Dermott is truly exceptional, she never falters in her performance.